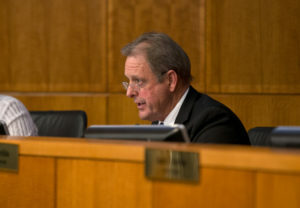 The North Las Vegas City Council moved to fire manager Qiong Liu in a 4-1 vote on Wednesday, despite her insistence that the termination was part of a “personal vendetta” and “witch hunt” by Mayor John Lee. The council voted to deny a previously negotiated severance “memorandum of understanding” between Liu and city officials, and then voted to fire her “with cause” after city officials said she retroactively increased her pay in 2015 without council approval. Councilman Richard Cherchio cast the lone no vote. The council’s decision means Liu will be immediately suspended without pay, though the council must approve a resolution if it wishes to finalize the termination within 30 days. Liu and her attorney, Kathy England, said they had not determined whether to appeal the decision through a public hearing, and may take other courses of legal action. 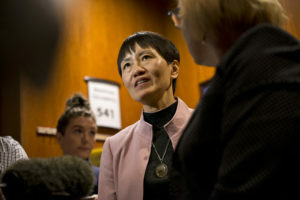 The rejected settlement agreement between Liu and the city would have given her an exit package worth approximately $613,000, but the council’s decision means the Liu will now be officially “suspended” from her job and, if the council approves a final resolution terminating her employment, will only receive accrued annual, sick and holiday pay. The firing comes nearly a month after a power struggle between Liu and Assistant City Manager Ryann Juden, a close political ally of the mayor. Liu fired Juden on Jan. 9, citing his “lack of productivity or interest” in his role of assistant city manager, but rescinded the firing a day later, taking immediate leave and announcing her retirement later in February. Juden was unanimously appointed acting city manager later that month. City officials in February scheduled an agenda item for Wednesday’s meeting to vote on Liu’s termination, saying that they had discovered evidence that Liu asking subordinate employees to process a retroactive pay raise between November 2015 and September 2016 without council approval. In a draft resolution and release given to members of the media, city officials said that Liu did not seek approval to process the pay raise and lied about sending a “fraudulent” memo to members of city council regarding the retroactive pay. Lee said he was troubled by the city’s investigation into Liu, and said he was concerned that she allegedly demanded an employee process the form giving herself the retroactive pay raise and emails suggesting that city IT staff refer any requests to view or request copies of her emails to her first. “There’s just way too many instances of suggestive discussion to try and turn the issue away from the fact that you had some problems,” he said. Liu said that she discovered the pay disparity in October 2017, and hadn’t acted on it after telling the city’s human resources director, Cass Palmer, and several members of the council about it. Disagreeing with the council and city legal staff, Liu said that the attempted change in pay was an administrative change that didn’t require council approval, and that her contract entitled her to the raise. Liu also said during the meeting that Lee asked her to either step down or take a secondary role to Juden in the weeks before her departure, and that the terms of her departure — including the retroactive pay increase — were negotiated in good faith with Lee. Lee denied ever asking her to step down from her position. Liu, who was born and educated in China, began working for the city in 2005, spending nearly 8 years as the director of public works before ascending to the role of city manager in June 2014. The city said it had contacted with the law firm of Fisher Phillips to conduct the investigation against Liu. Lee declined to say if the city would make the investigation public. Updated at 1:44 p.m. to correct the period of time in which Liu was seeking a retroactive pay raise.